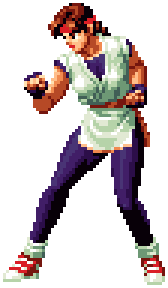 Yuri Sakazaki (ユリ・サカザキ) is the younger sister of Ryo Sakazaki and the daughter of Takuma Sakazaki. She is the first and only known female practitioner of Kyokugen Karate. In 1994, Yuri considered herself ready to fight in the King of Fighters tournament. She attempted to join Ryo's team in the first tournament. However, she was informed that her brother Ryo decided that only Ryo's friend Robert Garcia and her father Takuma Sakazaki would be allowed on his team. Ryo was even opposed to Yuri's entry to the King of Fighters tournament, believing that she would misrepresent Kyokugenryu Karate, but Robert had the opposite point of view on the entry. Therefore, she witnesses an invitation to the first King of Fighters tournament, held by King. She then rushes to urge King to join her and establish a team, alongside her friend Mai Shiranui. They both disputed with King, and King had no choice but to accept them both. They entered the Tournament as Team England. After the second King of Fighters tournament in 1995, Yuri was called back to the Kyokugenryu dojo by her father Takuma. One year later, Takuma decided to retire from competitive fighting. He suggested to Ryo that Yuri be a part of his team. Since Yuri thought she already had someone to team up with, Takuma made the decision to persuade her to join the AOF team by threatening to freeze her assets. She agreed to join Ryo and Robert in place of her father Takuma, much to Ryo's opposition and Robert's favor. To honor her father, Yuri vowed to fight on the AOF team, although she wishes that he quits being a pushover near the end of the tournament, and she is also ready to assist any way she can. In 1997, she lived as a carefree woman after the Orochi saga, but only for a short time. Once again, she was called back to training when the 1997 King of Fighters tournament is about to begin. She did not turn her back on her family or friends, and she trained harder than ever. Despite being the only female of the AOF team, she can well represent Kyokugenryu Karate.